a re-assessment with a second urinalysis (post-test) to determine the effectiveness of the chelation protocol. Heavy metals like lead, mercury, aluminum, arsenic, cadmium and nickel are harmful even at low levels and have no place in the human body; therefore the need to remove them is great. Although the human body possesses its own ability to eliminate undesirable heavy metals (ie: glutathione), when the burden becomes too great and/or our body’s chelating molecules too few, build-up, and even toxicity, can occur. Only through deliberate chelating protocols can you appreciably minimize the systemic heavy metal burden and reduce the occurrence of re-distribution of those harmful metals. What is a Provocation Urine Test? A “provoked urine test” means the administration of a chelating agent (ie: DMSA, DMPS, EDTA) to a person prior to collecting urine to test for metals. It is beneficial to establish an accurate baseline with which to compare post-chelation results. As each chelating agent detects different heavy metals, it is most logical to “pre-test” using multiple chelating agents, but ONLY for the specified time period. Once lab results indicate which metal levels are out of normal range, then an appropriate chelation protocol with a single therapy can be initiated. Note: CaNa(2)EDTA detects lead, aluminum, cadmium, and nickel. DMSA detects mercury, lead, arsenic, cadmium, antimony, tin and tungsten. What do I need for a “Pre-Test”? 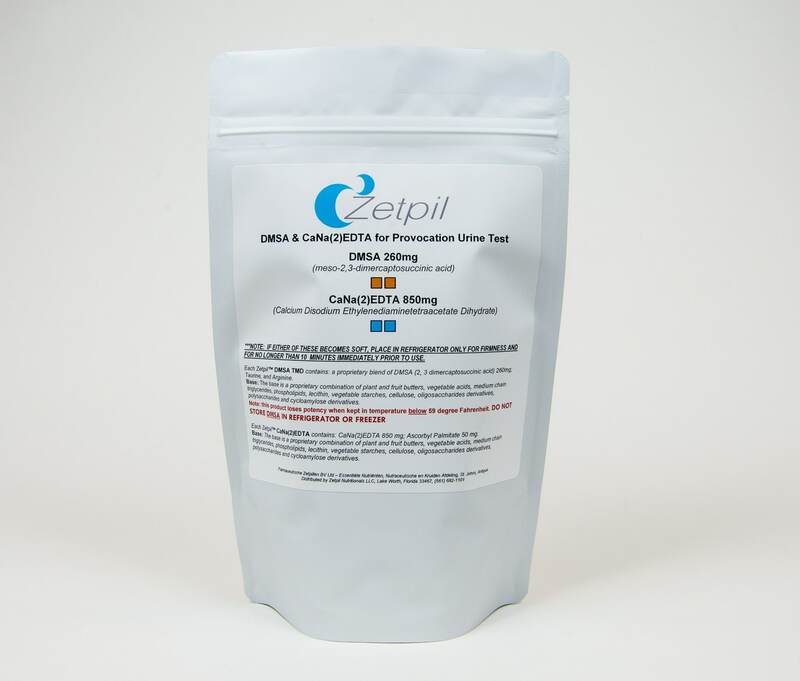 The Zetpil™ provocation test kit comes with the required suppositories needed for 5 days before you collect the urine sample. Why is the Pre-Test Important? What are the advantages of the Zetpil™ Provocation Test Kit? 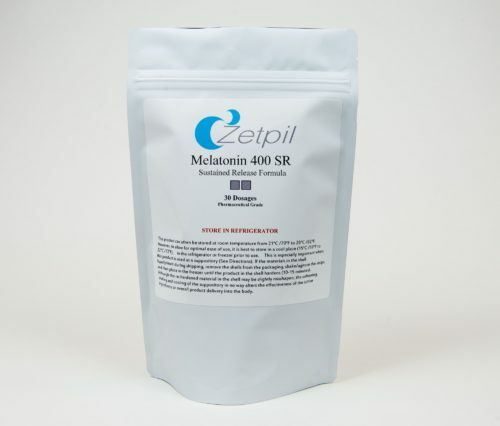 Zetpil™’s provocation test kit is superior first and foremost because it contains more than one chelating agent to most effectively determine the levels of numerous heavy metals simultaneously. Additionally, it is far more effective than oral administration as DMSA has an undesirable 20-25% absorption rate and CaNa(2)EDTA has no oral absorption but rather is rapidly excreted through the bowels and is routinely administered as an IV treatment. Zetpil™ suppositories are far safer, less expensive and shown to be as effective as IV treatments. Nights 1 through 5: Take 1 DMSA before retiring. Nights 1 through 5: Take 2 CaNa (2)EDTA five minutes apart before retiring. When choosing to take these products as a suppository, it is advised that you rectally insert the DMSA first, then wait approximately 5 minutes and insert the first CaNa(2)EDTA, wait another 5 minutes and insert the second CaNa(2)EDTA. If you get up in the middle of the night to urinate, this urine must be collected. Collect first urine in the morning and subsequent urine for the next 4-6 hours. If you have difficulty urinating, please drink 8-16 ounces of water. Once you have collected the required specimen, please follow the instructions on the kit from your selected laboratory for proper storage and mailing. ***NOTE: IF EITHER OF THESE BECOMES SOFT, PLACE IN REFRIGERATOR ONLY FOR FIRMNESS AND FOR NO LONGER THAN 10 MINUTES IMMEDIATELY PRIOR TO USE. 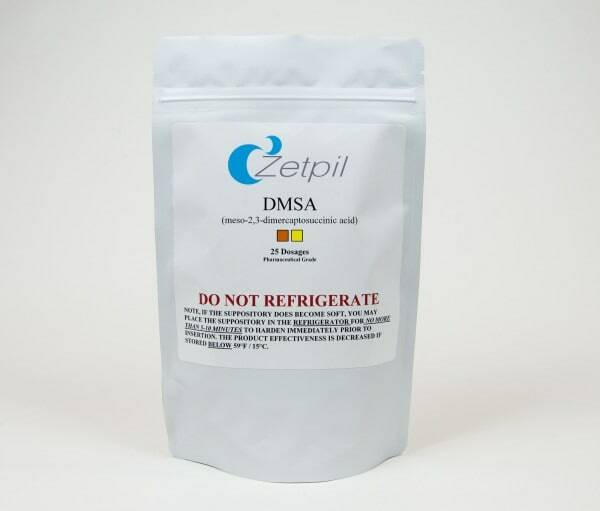 Each Zetpil™ DMSA TMD contains: a proprietary blend of DMSA (2, 3 dimercaptosuccinic acid) 260mg; Taurine, and Arginine. Base: The base is a proprietary combination of plant and fruit butters, vegetable acids, medium chain triglycerides, phospholipids, lecithin, vegetable starches, cellulose, oligosaccharides derivatives, polysaccharides and cycloamylose derivatives. 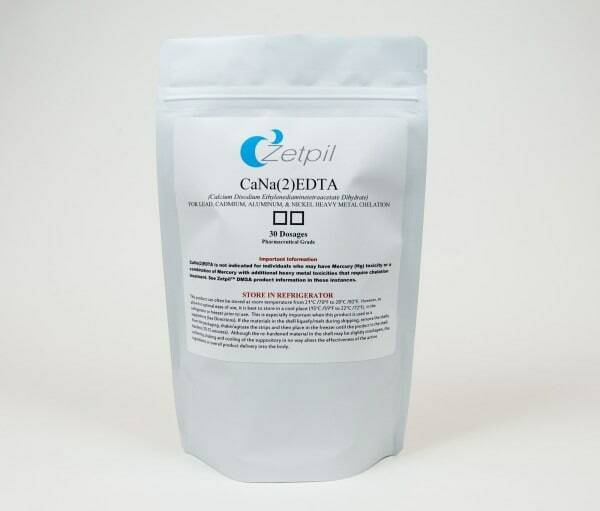 Each Zetpil™ CaNa(2)EDTA contains: CaNa(2)EDTA 850 mg; Ascorbyl Palmitate 50 mg. If nausea, vomiting or rash occurs, decrease dosage or discontinue use. DMSA & CaNa(2)EDTA should not be used by pregnant or lactating women. DMSA has been used safely in children ages 3 and up. However, the safety and efficacy in pediatric patients less than 12 months of age has not been established. DMSA and CaNa(2)EDTA suppositories should NOT be taken unless you are under the supervision of a qualified health care professional. This product contains an extract from soybeans. This product is contraindicated in individuals with a known hypersensitivity to phospholipids, sesame seed oils or any of the ingredients and should avoid taking this product. Disclaimer: These statements have not been evaluated by the FDA. This product is a Federal Food, Drug, and Cosmetic Act compliant combination of naturally derived FDA GRAS (Generally regarded As Safe) herbal, nutraceutical, vitamins, minerals and amino acids products legally sold in the USA. In accordance with FDA regulations, when taken orally, this product may be considered a dietary supplement as defined by section 201(ff) of the Act, 21 U.S.C. § 321(ff), nor is this product a drug as defined in section 201(g)(1) of the Act, 21 U.S.C. § 321(g)(1). This product is not intended to affect the structure or function of the body and is not intended for use in the diagnosis, cure, mitigation, treatment or prevention of disease in man. Any nutritional suggestions and research regarding this product are provided for informational purposes only, and are not intended to diagnose, treat, cure or prevent disease nor should any information provided be used as a substitute for sound medical advice.